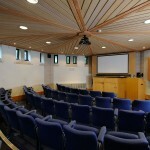 Hire a Lecture Theatre for a Conference in Canterbury, Kent. Located within our modern conference centre. The AV lecture theatre is perfect for those wishing to hold smaller event presentations or lectures in Canterbury and offers the latest in AV and computer technology.